For private use only. No part of this document may be quoted or reproduced without the express permission of the Greek Ministry of Culture. Note: Click on Figs 1, 4 & 10-12 to retrieve more detailed images. Use your browser's "back" button to return to this page. 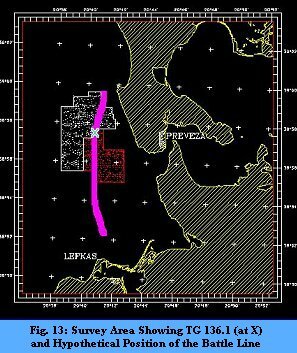 In the summers of 1993 and 1994, a team of American and Greek researchers scanned the ocean depths where, 20 centuries before, Mark Antony and Cleopatra fought Octavian for control of the Mediterranean world. 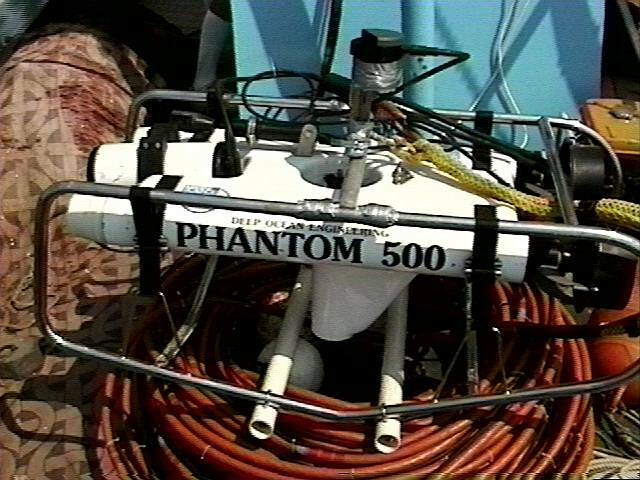 Using computer, video and remote-sensing technology, Project members hoped to locate on the sea floor actual physical evidence from the battle. Our expectations were based on various threads of evidence that suggest 60 or more bronze warship rams plummeted to the bottom during the course of the battle on September 2, 31 B.C. Following the 1994 season, we reported in Newsletter No. 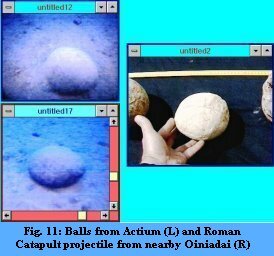 2 that we had located what might be catapult balls from the ancient battle. Now, after more than two years of patient research, we can say with certainty that the smooth stones we noted in the depths off Preveza are appropriate in both size and shape for use with naval catapults of the first century BC. If we are correct in assuming that these are ancient catapult projectiles, then we are in the region where the two battle lines discharged their catapults and finally engaged. Considering the implications of these conclusions, we asked the Greek Ministry of Culture for permission to continue our work at Actium this coming autumn. We are happy to report that our permit has been approved and our work scheduled to begin on September 29. If our suspicions prove correct, we are poised to retrieve the first physical evidence ever recovered from an ancient naval battle--a battle that stands as a turning point in Western history. The assassination of Julius Caesar in 44 B.C. created a power vacuum in the Roman Republic which resolved into an uneasy and jealous alliance between Caesar's second in command, Mark Antony, and his grand nephew Octavian. A compromise was eventually reached to divide the leadership of Rome's vast territories. Octavian took Italy and the western Mediterranean; Antony took the Near East and Greece and married Octavian's sister to seal the bargain. When Antony dismissed his wife and replaced her with Cleopatra VII, the astute and captivating Queen of Egypt, war was the inevitable result. On 2 September 31 B.C., Mark Antony, Cleopatra and Octavian fought the crucial naval battle in a war for control of the Roman world. 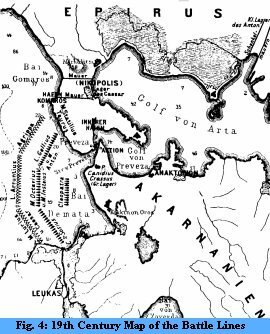 Warships clashed near the entrance to the Ambracian Gulf on the western coast of Greece; a nearby cape gave the battle its name (Fig. 2). By the end of the day, Octavian's navy had so completely vanquished their foes that Antony never recovered. In less than a year both he and Cleopatra were dead and Octavian was left to ponder how to restructure the Roman state. In time, the Battle of Actium came to be seen as the birth event of the new order that we now call the Roman Empire. As such, it represents a pivotal event--a turning point--in western history. For such an important event, it is sad that we know so little about its precise details. The ancient battle descriptions were written in a way that emphasized the debased character and weak leadership of Antony and Cleopatra, lauded the victor and distorted the evidence from which we must draw our own conclusions. The general outline of the battle's events and the protagonists' strategies can be determined, however, and our search may assist in corroborating this interpretation. The forces of Antony and Cleopatra, camped near the swampy lowlands of Cape Actium, had been depleted by malaria before the battle even began--severely reducing the contingent of oarsmen. Supply lines had been cut, further weakening morale and support. Faced with a bleak situation that worsened every day, Antony burned those ships he could no longer man and prepared with Cleopatra to withdraw southward from the gulf with as much of his force as possible. On the morning of September 2nd, Antony led 230 warships (cf. Fig. 3) through the straits toward the open sea. There he met the fleet of Octavian and his admiral Agrippa, arranged to block his exit in an arc from north to south (Fig. 4). Outnumbered by almost two to one, Antony had no choice but to keep his ships tightly clustered and wait. He had hoped to use his biggest ships to drive back Agrippa's wing on the north end of his line, but Octavian's entire fleet stayed carefully out of range. Shortly after mid-day, Antony was forced to extend his line out from the protection of the shore, and then finally engage the enemy. According to our most detailed accounts, Antony's largest warships were undermanned and, as a result, were unable to execute the tactics for which they were designed--powerful, head-on collisions. Octavian's commanders kept a respectful distance between themselves and Antony's powerful prows until his crews began to tire. At this point, Octavian's fleet finally engaged. When the ships came together, the air was torn by catapult fire, volleys of arrows and sling bullets, as the men on each side prepared to board and grapple their enemies. Eventually, Octavian's numerical advantage began to take its toll, as more and more of Antony's ships were surrounded and put out of action. At some point, after Antony's plan had clearly failed, but when the fighting was still intense enough to limit pursuit, Cleopatra led the rearguard squadron of 60 ships through the center of the melee and hoisted sail to flee south. Her move precipitated a general flight, but the bulk of Antony's fleet was unable to disengage from their opponents. Antony himself transferred his flag to a smaller vessel and successfully slipped past Octavian's line. The remainder of the fleet was not so fortunate and was abandoned to an enemy intent upon its destruction with fire projectiles. In the chaos that resulted, the greatest casualties were sustained. One writer describes the battle's end as a great burning of Antony's ships, another says the sea was so choked with royal wreckage that the water was flecked with purple and gold. The destruction was complete; from Antony's original fleet of 500 warships, only a few more than 60 returned to Egypt. In less than a year, Antony and Cleopatra were dead and the struggle for control of the Mediterranean was over. 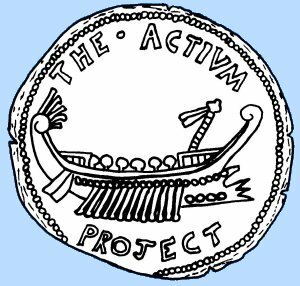 The Actium Project was formed in 1993 to examine the sea floor in the region where the ancient battle was fought (Fig. 5). 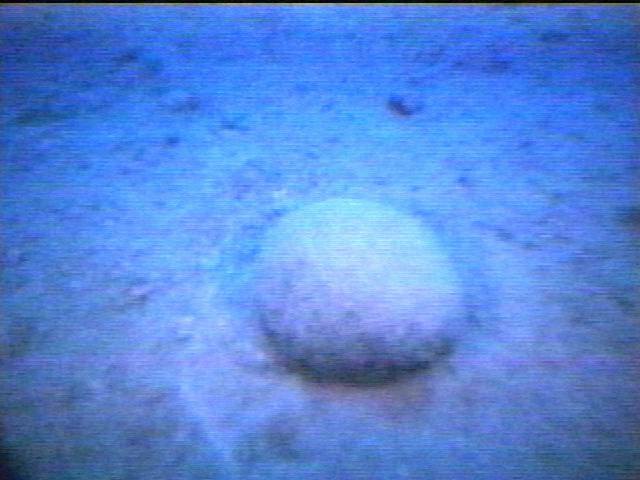 Our hope was to recover physical evidence from the conflict that had been preserved on the sea bottom. Since we were the first researchers to search for the site of an ancient naval battle, we were uncertain what we would find. One thing was beyond doubt, however: we did not expect to find any warships in the depths at Actium. This is because ancient warships were not heavily ballasted and therefore did not sink to the bottom when destroyed. We also knew that most of the battle gear dumped into the water (boat hooks, arrows, spears, helmets, body armor, buckets, axes and ship's gear) would have not survived, unless it had somehow been covered by the sediments of the bottom, and then we were unlikely to see it. When we began our search at Actium,/ we initially hoped to find one of the primary weapons of Antony's massive ships--heavy bronze rams mounted at the waterline on the prow. Made of high grade bronze and weighing half a ton or more, these weapons could have survived the centuries on the sea floor. Such a ram was recovered by chance near Athlit, Israel, just south of Haifa in 1980 (Fig. 6). Weighing 465 kg. and measuring 2.26 m. in length, the weapon came from a medium-sized Hellenistic warship of the 2nd century B.C. Both beautiful and technically sophisticated, the Athlit ram provides our first detailed evidence for the complex design of ancient warship bows (16 timbers were preserved inside the weapon). 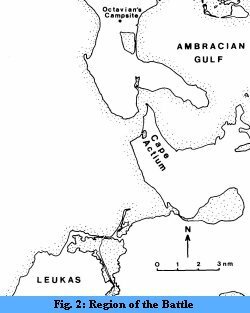 At Actium, 60 to 90 such rams lie waiting to be found on the sea floor in the region where the battle was fought. But how could we find them? Here is where stone catapult "bullets" might help us. Just before the battle began, the fleets faced one another in long parallel lines and launched thousands of stone balls at one another. Thousands of stone projectiles, therefore, should litter the sea floor in the region where the fleets first engaged and should thus reveal the original location of the ancient battle line. 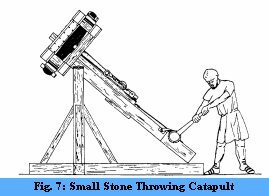 Because stone throwing catapults were very heavy--the smallest calibers weighed almost 2000 kg. (Fig. 7)--only the smaller calibers were placed on naval vessels and taken into battle (Fig. 8). The balls we should expect to find in the battle zone, therefore, will be small, ranging in size between 11 and 16 cm. (4½ to 6¼ in.) in diameter and weighing between 1.5 and 4.5 kg. (3.3 and 10 lbs). 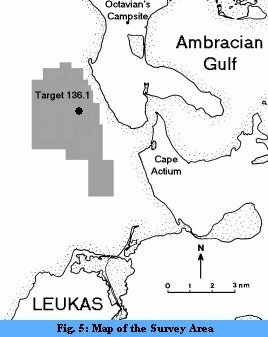 During two seasons of fieldwork in 1993 and 1994, we managed to cover almost half of the designated survey area (50 of roughly 110 km2; cf. Fig. 5). By the end of the second season, we had compiled a list of 16 anomalies, called "targets" which we felt merited further investigation. 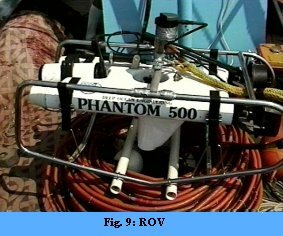 Of these 16 targets, seven were selected for inspection with a video-equipped submersible robot (ROV) owned by the Marine Science Department of the University of South Florida. This robot was generously made available by Prof. Norm Blake and was funded through a grant from the USF Division of Sponsored Research. 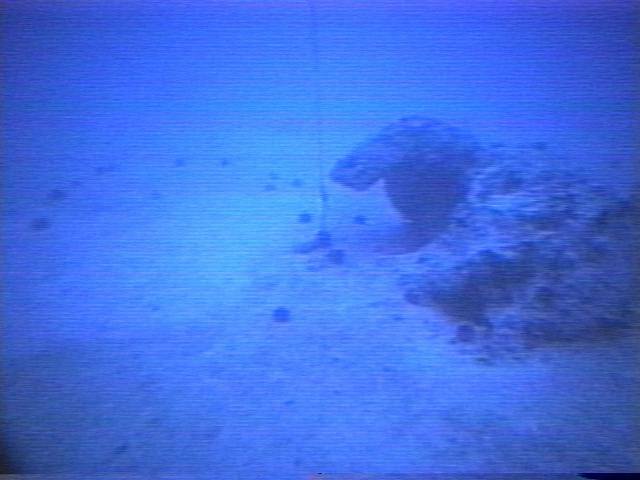 At all but one of the target areas, the robot's video revealed geological features defined by rocky outcrops on an otherwise sandy bottom. 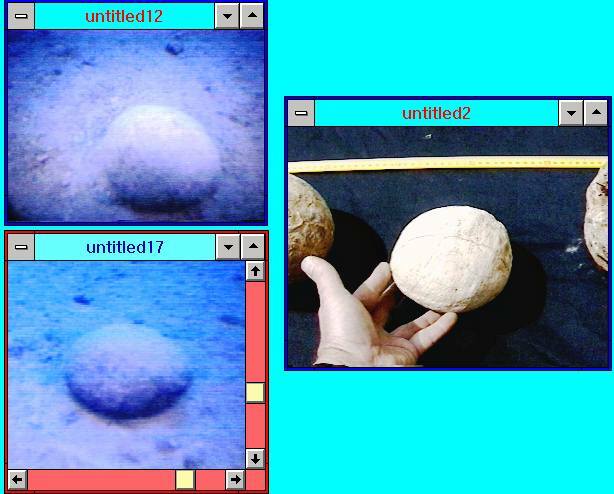 At Target 136.1, however, the camera revealed five intrusive artifacts: three ovoid stones and two curved objects that appeared to be metallic in composition (Fig. 10). At first, we were cautious about identifying the stones as catapult projectiles. But then we found that their small sizes (12 cm. = 4.7 in. in maximum diameter) and irregular shapes were paralleled by hundreds of examples from Greek and Roman sites from Spain and North Africa to Greece, Rhodes, Turkey and Israel (cf. Fig. 11). The Actium stones' smooth ovoid shapes indicate they were manufactured from locally available stone--in this case, river or beach cobbles. Their non-encrusted surfaces probably resulted from their recent removal from bottom sediments by a trawler's net whose remains lie tangled around the bedrock outcrop in the center of the target area. Because the area's rocks snag the trawlers' nets, it seems unlikely that the region was disturbed more than a few times until the net got tangled and the region was avoided. The balls, therefore, have probably not strayed far from their original positions. 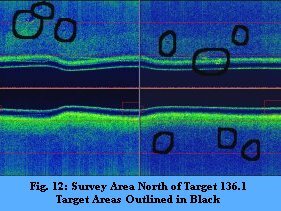 Indeed, our sonar record reveals that for 150 meters to the north there are additional small targets that lie scattered on the bottom (Fig. 12). 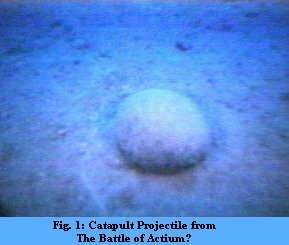 Because these balls currently lie too far from shore for anything but human intervention to have placed them there, and because no other known battles from ancient or medieval times are recorded in this particular region, we feel they probably came from the Battle of Actium. We will be able to say more, however, when we learn the composition of the balls and their exact weights, which should correspond to known ancient "calibers" of catapult shot. 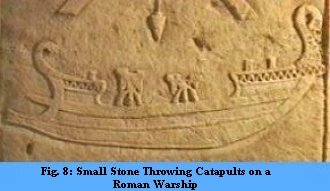 If we are correct in assuming that these are ancient catapult projectiles, then we are in the region where the two battle lines discharged their catapults and finally engaged. In order to verify our suspicions about the ovoid stones, we have prepared an inexpensive one week field season for the autumn of 1997. Our main goal is to recover the three stone balls (replacing them with numbered markers) and to examine the curved metalic objects in greater detail. On our first day of fieldwork, we plan to reacquire the site by means of the DGPS (Differential Global Positioning System) coordinates we recorded for the site in 1994. If our past experience with this system is any indication, we will steer a course directly to the region and drop a marker on top of the site on our first try. A professional diver (breathing a mixture of oxygen and helium) will descend to the target to photograph, mark and place each stone in a separately marked bag that we will recover by hand from the dive boat. 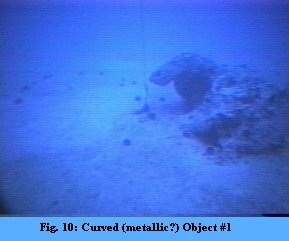 The diver will then photograph the curved metallic objects and test their composition with a hand-held magnetometer and metal detector. If all goes well, these tasks should be completed in one dive session. For a period of roughly two days, we will resurvey the region to the north of Target 136.1 (Fig. 12) at a higher resolution than was done in 1994. To do this, we will deploy the sidescan fish closer to the bottom (at 10 instead of 20 meters) and set the range to 40 instead of 100 meters. 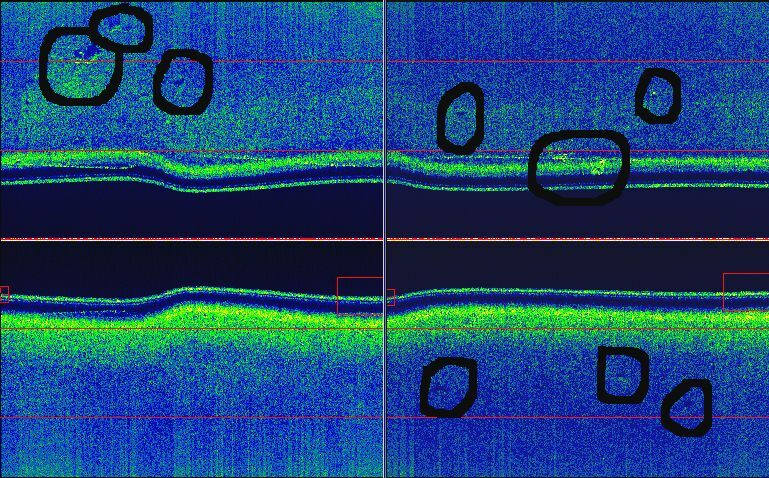 In order to increase the resolution of our sonar image still further, we may also deploy a sonar fish running at 675 Khz instead of 330 Khz. In sum, the 1997 season is designed to provide us with an answer to the question that will determine the future direction of our search: have we indeed found a portion of the ancient battle zone (Fig. 13)?